Hi, I'm a new member on this forum. I recently purchased a non working Toshiba HX-10 on EBay. When I power the machine on, all that is displayed is a black screen. I checked the caps lock light and it's not working, neither do I get any sound when I press Ctrl-G. The voltages are all present and correct on all of the chips, I have tested the clock signal on the Z80 and that is good. There is activity on the address and data lines. I tested the crystal on the TMS9929 that is good also. I dumped the ROM to a file and tested it on OpenMSX, it is also O.K Then I turned my attention to the DRAM chips, the /CAS line is permanently high. This line is connected to pin 5 of the TCX-1007 chip (IC25). I have spent a lot of time on google, trying to find some info on these chips, to no avail. Does anybody here have any info/datasheet on these chips? Also, I know this has been asked a thousand times before, but does anybody know where to get a schematic for the HX-10? Any addition thoughts or insight that any of you have would be greatly appreciated. Then I turned my attention to the DRAM chips, the /CAS line is permanently high. This line is connected to pin 5 of the TCX-1007 chip (IC25). -> That 64-pin IC (TCX-1007) is some sort of custom IC / MSX engine. I'm guessing 'S3527 minus the PSG' (note absence of a 8255 on the board). 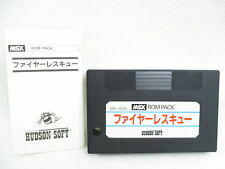 "MSX engine" - that I would have guessed too. It probably works alright but it may help to know what IC it is, when tracing the fault. Yes, I suppose if /CAS on one of the dram chips is stuck high, it might hold all of them high. Thanks for the link to the previous thread, I have found a datasheet for the Yamaha S3527 it may prove helpful in mapping out the TCX-1007. I have checked the pins of TCX-1007 with my logic probe and there isn't much activity on the pins on the lower side of the chip. I think my next move is to trace all the connections on TCX-1007 to determine what is supposed to be happening. Do you have a cartridge with an external RAM? Try to find it and insert into slot A. See what happens. Do any game cartridges work? 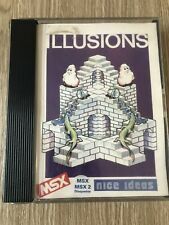 I haven't got any cartridges at the moment, this is my first MSX. I will look out for one on ebay, which ones will have external RAM? I think this is the best one. I have one of those. The price is reasonable. O.K I will get one to try. O.K, quick update, made myself an arduino based DRAM tester and tested all the D4164C chips(IC7 - IC14) and it turns out two of them were bad (IC8 and IC12). I have bought some new ones and put in chip sockets for all the DRAM. Now all is well and I have a perfectly functioning HX-10, thanks for all the help and suggestions. It seems quite common that these old machines get a memory fault. I know I'm resurrecting a really old thread, but I have an HX 10 with the exact same problem: Black screen, no CAPs light. It had a bad ROM which I replaced with an EPROM, but /CAS is always high. I socked and replaced all the RAM ICs (one of them was faulty) but I'm still with high /CAS and black screen. Since there doesn't seem to be a publicly available schematic for this model, I'm kind of at a loss. The /CAS signal is produced by the TCX-1007, but I'm sure a lot of the glue logic chips around it contribute to combine signals. Maybe one of those is faulty and causing /CAS to be always high. Any ideas what else I could check?